As part of our “Food Theme” the students in the River’s Class wanted to know…”Where Does Our Food Come From”? For our first project we read the book, How to Make an Apple Pie and See the World, by Marjorie Priceman. The little girl in the book wants to make apple pie, but the store is closed so she decided to travel around the world to gather ingredients. She travels to Italy (wheat for flour), France (chicken for eggs), Sri Lanka (bark of a Kurundu tree for cinnamon), England (Cow for milk), Ocean (saltwater for salt), Jamaica (sugar cane) and finally Vermont for apples. 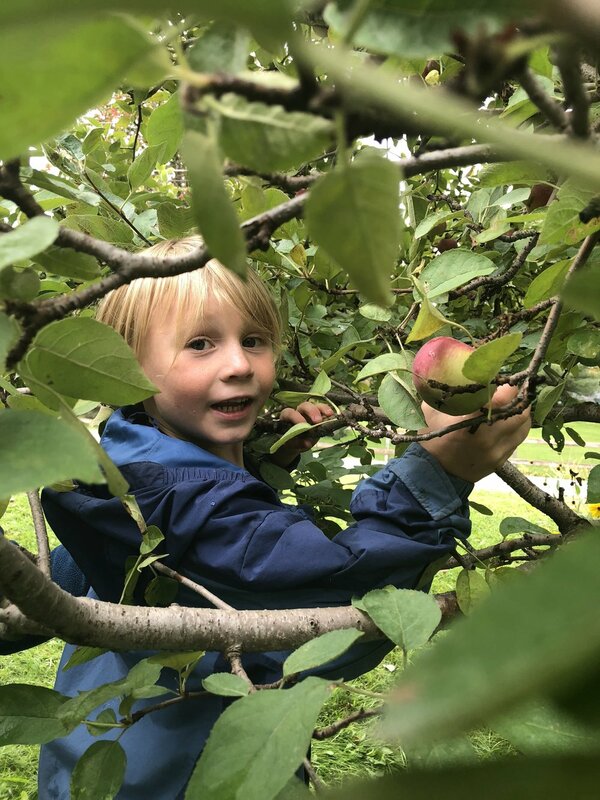 We were lucky that the store was open for us, but we did travel to Hunger Mountain Orchards in Waterbury, VT to pick our own apples. The students found these places on the map and connected them to the correct ingredients. The students found these places on the map and connect them to the correct ingredients. Finally on Friday we were able to taste our pie!